Jockey Mitchell Murrill has wasted no time in making up for his lost ground in the jockey standings at Arlington International Racecourse. The journeyman jockey was a familiar face the last two seasons, riding strongly enough to finish second in number of wins in both 2015 and 2016, but spent the early part of the 2017 season riding at Delaware Park. 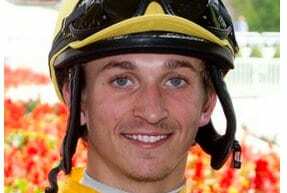 Murrill, who celebrated his 23rd birthday Thursday, rode eight winners in just 53 mounts at Delaware before deciding to finish out the season back at the Chicagoland oval. Riding his first day back at Arlington on July 7, Murrill picked up a win with his second of three mounts that card when he piloted Feel The Thunder Stable's Cannes to a two-length victory for Stidham. Since then, agent Tim Hanisch has worked to get his rider every possible opportunity, and Murrill has delivered encouraging results in his brief time back. Sitting sixth in the jockey standings at the start of racing Sunday, the Alabama-native had 33 wins in 176 starts, just eleven wins from the second spot currenly held by Chris Emigh despite Murrill missing the first 27 racing days of the meet. Murrill also holds the second highest percentage of top-three finishes behind overall leading rider Jose Valdiva, Jr. for jockeys with more than 10 starts at Arlington with a total of 87 placings, or a strike rate of 49%. This entry was posted in People and tagged arlington, Arlington International, Arlington Park, Chris Block, delaware park, jockey, mike stidham, mitchell murrill, tim hanisch by Press Release. Bookmark the permalink.